AMD are ready with their new series of Threadripper CPUs. We expect nothing short of our threads ripped to subatomic particles. We put on our safety clothes at put them to their test. AMD has released a new Ryzen lineup, a new Threadripper, aptly named Threadripper 2. Here at Tweak we’ve been sent a test kit including the AMD Ryzen Threadripper (2) 2920X and 2950X. Because of their similarities, we’ve decided to make this as a single review. A Threadripper CPU is marketed as a HEDT processor (High End Desktop), where the competition is the truly big boys from Intel. 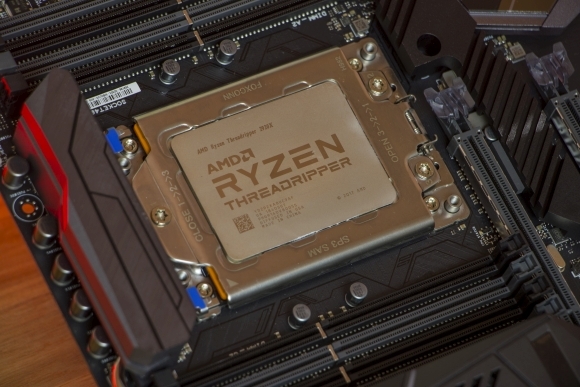 The original Threadrippers were regarded nothing short of a brilliant move from AMD, and we’re very excited to see if they’ll be able to follow the same recipe with Threadripper 2. Seeing as AMD hasn’t released a new chipset along with the Threadripper 2, we won’t be going into details about this aspect. Below you can see the test kit AMD sent us for testing out the AMD Ryzen Threadripper 2920X and 2950X. 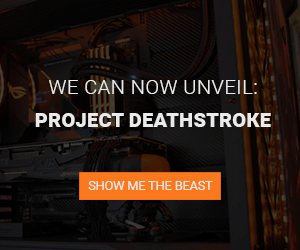 We’ve got our fingers crossed that we’ll be selected for the Threadripper 2970X and 2990X as well. We kick off by mounting the AMD Ryzen Threadripper 2920X onto the ASUS ROG Zenith Extreme X399 motherboard. 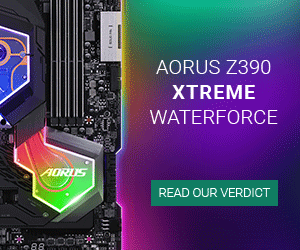 For mounting, the included AMD tool should be used, which is handily set with a torque measurement to prevent you from overtightening the bracket on the motherboard. With that out of the way we’re ready to assemble the test unit and start benchmarking the 2920X, before making our way to the 2950X. During the test, we sadly had no RTX cards available, so we decided to use our own trusted MSI GeForce GTX 1080 Ti Gaming X 11G, as the Ryzen Threadripper platform doesn’t come with an iGPU. Seeing as the Enermax Liqtech 240 TR2 cooler comes rated for max TDP of 500W, our Threadripper 2920X and 2950X can boost to their full potential of 4.3 and 4.4GHz. AMD has made sure to provide some bang-for-the-buck with the new 2920X and 2950X processors, as can be clearly seen in the screenshots above from 7-Zip. The new iteration really allows all the cores to “stretch their legs” and push out some serious data. Once again, we see a significant performance boost over the previous Threadripper 1920X. The Intel CPUs were equally routed by the new Threadripper 2920X, and even further by the 2950X. The Photoworxx test shows us how many graphical processes a CPU is capable of handling. The result is shown in megapixels/second, and once again Threadripper 2 takes a clear lead. Threadripper 2920X and 2950X have the same memory controller, and thus have the same results of DDR4 performance. With our memory, set at 3200MHz, the results come in sweet and juicy. The memory controller is doing a stellar job, and Threadripper once again takes the top spot. In Cinebench R15, the CPUs are tested for their ability to render a high-resolution image. And once again we see the Threadrippers hitting some homeruns. Especially 2950X comes out on top with its 32 threads, looking quite interesting while benchmarking. Moving on to the Passmark test. The chart is not sorted, someone, we won’t mention who, forgot to do so – but hopefully the results are clear despite this. The Threadripper, especially 2950X, reigns supremely once again, due to its core/thread superiority. In the single core test, the Threadrippers are put in their place – for the first and possibly last time – by the Intel i9-9900K. This makes perfect sense as the 9900K boosts all the way to 5 GHz in single core mode. Had it not been a clear winner, we would’ve started to wonder. Handbrake is a piece of software used for reencoding video material, thereby showing the CPUs capabilities for video rendition. A task which HEDT CPUs are known to handle, as they’re often used in workstation builds. PCMark 10 will put your PC through the ringer on a bunch of parameters that closely resemble everyday use. After completing the task, an average score is calculated. The Threadrippers do a solid job here. In wPrime it all comes down to crunching prime numbers. A heavy and difficult task for any CPU. 32 million numbers in the first test, while the second sends a massive 1.024 billion prime numbers through the machinery. 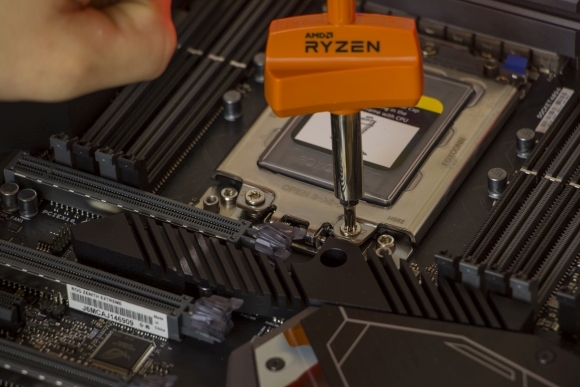 With 32 threads, the AMD Ryzen Threadripper 2950X chews its way through this task in less than 50 seconds. Impressive! Power is needed, and as with the previous iteration of Threadripper, you will need 2 8-pin EPS connections and a solid wattage behind those. Both CPUs have a TDP of 180 watt and a single 8-pin EPS will “only” be able to deliver 150 watts. Settling with a single 8-pin EPS, you will simply risk overheating the motherboard. As you can see, the 180 watts are well utilized, which compares well to the performance delivered by both CPUs. The temperatures, in both idle and load, are quite satisfactory, and we were by no means bothered by noise during the tests. The temperatures could probably have been better, had the system been mounted in a case with good airflow, and not a test bench with still air around it. But we’ll settle. The big picture today shows that AMD has been able to bring the success from the first Ryzen Threadripper generation and develop it further – sanding off any rough edges and cranking up the performance of the many cores. No matter whether you want an extra powerful HEDT machine with 12 cores or you need the extra brute force of 16 cores in the 2950X, you will find that the new AMD Ryzen Threadripper 2 processors tested here are excellent choices, and that they truly give Intel real competition in the HEDT market. Overclocking always has its place in benchmarks, but AMD has ingeniously made Turbo Boost go all the way to 4.3 or 4.4 GHz (Threadripper 2920X/2950X). This makes pushing the Threadripper CPU any further a challenge. We weren’t able to make the 2920X go any further than 4.3 GHz. The 2950X, however, we did manage to push an extra 200 MHz on all 16 cores. For this reason, you’ll only see the 2950X OC vs. stock results in the overclocking test scores below. 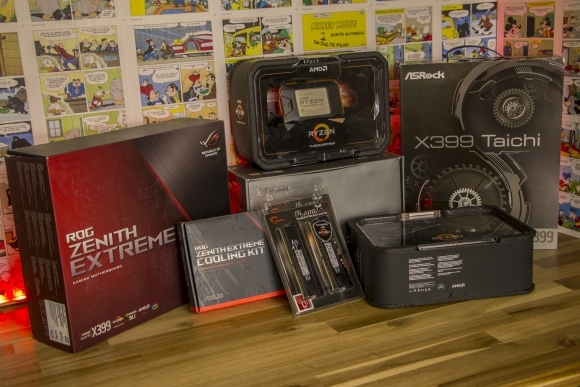 As the overclock did nothing for our DDR4 benchmarks, we’ve decided not to show them again. Actually, the 2950X became less capable in handling graphical processes – as you can see on the Photoworxx test scores. If we’re to conclude anything from the overclocking experience, it would be that it doesn’t really matter. Sure, it’ll give you some extra performance, but it also requires quite a lot more power, which leads to added heat. It doesn’t really show much in the temperatures, but it did become very clear in the noise levels. That’s why we’d prefer to go for the rated turbo speed and enjoy the benefits of the many cores and threads, which provide plenty of power. These are the views of the Tweak.dk staffs first fun with the Ryzen Threadripper 2 series. Below you’ll be able to read some of the impressions we’re left with after running tests with the two processors. Common to both of today's processors is that they are a decent upgrade from the last iteration of AMD Ryzen Threadripper. The 2920X and 2950X has had small adjustments on the base- and boost clocks, which gives a decent performance upgrade. Overall, AMD really does make an impression on us with their new Threadripper CPUs. You can have 12 or 16 cores to play with, and we really do believe that they’re making a lasting impression on the HEDT market. The only place they really fall short is in their single core performance where the Intel Core i9-9900K boosts significantly better. 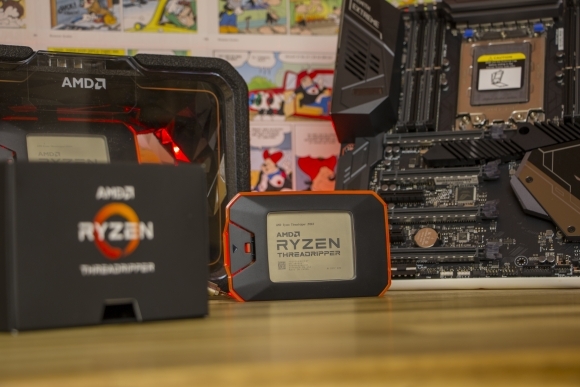 AMD has really taken the stock clocks up a notch from the previous generation, which has given Threadripper 2920X and 2950X a significant single core boost, even though they still can’t compete with 9900K. We’ve been thoroughly soul searching for something negative to say about the AMD Ryzen Threadripper 2920X and 2950X, but we must stay true. Ryzen truly is a stroke of genius from AMD. They might not be able to overclock a lot as they are already boosted to their maximum. But that’s okay. We’re left with a feeling that most people who buy a Ryzen Threadripper 2 do so to use the many cores they offer, and not so much for the clock speeds. If we really need to find something to linger on, it would be the power consumption, which requires a truly efficient cooling solution to gain the most from these monsters. Something our reviewer Jan also mentioned in his AMD Ryzen Threadripper 1920X review. The total evaluation for both CPUs is a very nice score of 9.5 and an editor’s choice reward. We would go with the AMD Ryzen Threadripper 2950X tomorrow without hesitation, if we were to build a workstation. DDR4 base clock of 2933 MHz!